Same here. Just a 10 day free trial… seems to have been advertised in version 2.1 as free but in 2.2 now shows a free 10 day trial or pay for premium. Scroll down to the section “Free Spam Protection” and try doing the steps they suggest in the My Verizon page online or the My Verizon app on your phone. 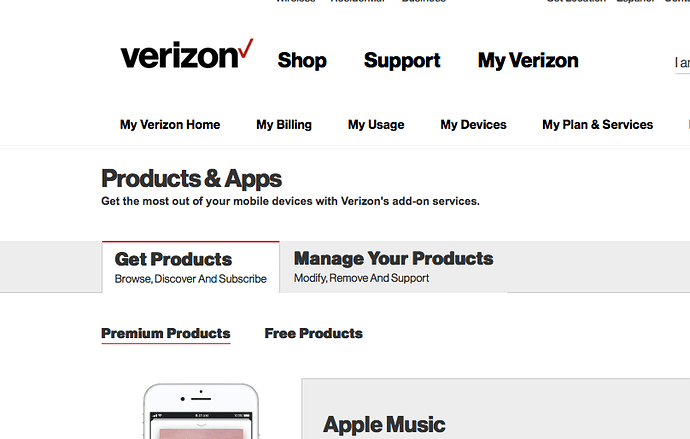 The FAQ claims you can also turn it on by logging in to the My Verizon site. What does it say there? I check the Verizon site. 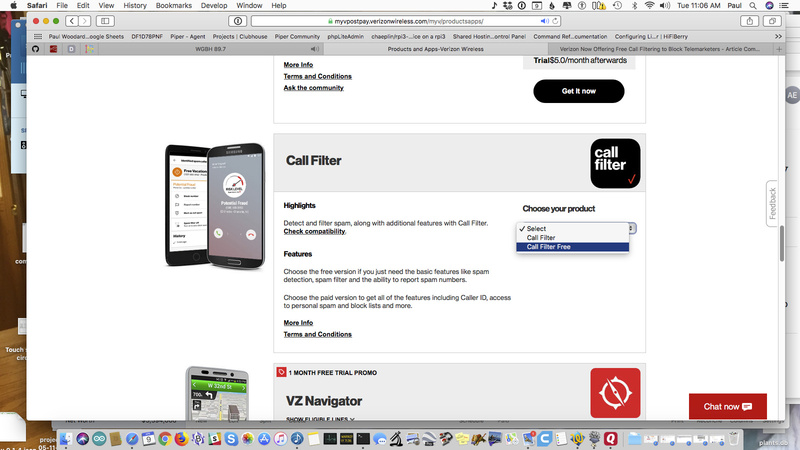 While there was a page that provided instructions on how to set up free Verizon Call Filtering via the web site, when I check my account free Verizon Call Filtering was not an option. The only option for Call Filtering was a subscription. I am wondering if (1) Verizon offered a free service and withdrew it or (2) the free service is available only in certain states. I think it’s time for someone to just call Verizon support and ask. Ok, I found it on the verison site. NOTE: I have 5 lines and I had to go thru this multiple times since it only shows two lines at a time. Regulation has failed to solve this problem in the past, and will continue to fail. A market based solution is needed, and very easily implemented: the carriers should charge every caller some token amount, say 1c, for every call placed. No exceptions! No bulk calling plans! 1 cent would probably be enough, but I’d gladly pay 10c per call to avoid the scourge of spam calls! It would be a win for me, and I bet the carriers would make more money. Why isn’t this obvious? That’s an interesting idea. This wasn’t a big problem back when calls actually cost money. I’m with you on preferring a market-based solution if feasible, and I think that’s Ajit Pai’s view as well. I dislike a lot of things about him, but I appreciate how he’s using regulatory pressure to encourage the carriers to do the right thing instead of taking a much more heavy-handed approach. I’m not sure I understand that point. Doesn’t regulatory pressure come from the threat of being able and willing to implement “heavy-handed approaches”? If you have a regulator who’s unwilling (or incapable) to enact such measures, why wouldn’t the industry just consider his threats empty thus rendering his regulatory pressure zero? Tried to set up Verizon Call Filter at the free tier but it is only offering me try-for-free or subscribe now. They were also relentless about downloading my Contacts, a 3,200 name contact list including business notes and key data (such as birthdates) which I’m not about to let any service have access to. Meantime I created a songfile that is silence (in GarageBand), converted to a ringtone format and saved it as Silence is Golden, added it to the iPhone. Now, any time a junk call comes in, I assign to an existing contact (such as “JUNK 01”) which has its ringtone set as Silence, and also click BLOCK THIS CALLER. This has worked well for over a year now. I do get calls, but no one can bug me twice! I’m up to JUNK 40 with over a thousand bullsh-- numbers stored in there. I probably needs access to your contacts so it doesn’t flag phone numbers that match contact phone numbers as spam. Now, any time a junk call comes in, I assign to an existing contact (such as “JUNK 01”) which has its ringtone set as Silence, and also click BLOCK THIS CALLER. This has worked well for over a year now. I do get calls, but no one can bug me twice! I thought the problem with that approach was that many telemarketers these days like to scam others’ phone numbers. So when you block them a) you’re blocking somebody else and b) they will reach you again since they’re always using different numbers. I tried via the app store and got only the free trial or subscribe. Going to the web site first and then to the app store, as described here, worked for me!!! I have the free forever version. I’ll see how it works out. 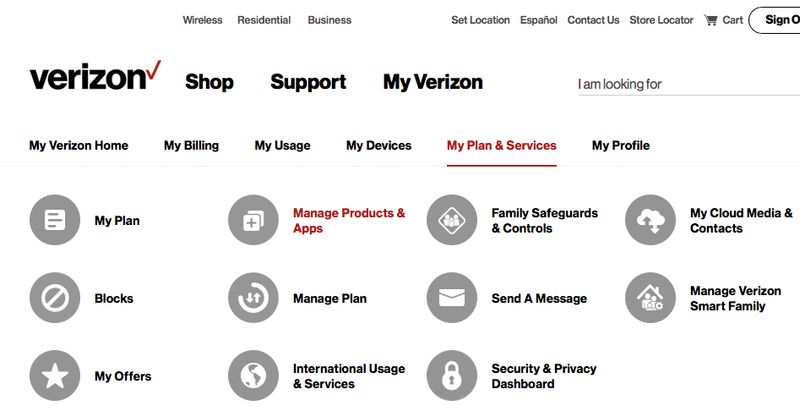 The Verizon website approach appears to have worked for me, too…plus I had the option to checkbox both my and my wife’s phone numbers. Thanks! I’ve been getting up to half a dozen calls a day from MD numbers all week. Blocking them didn’t help because the last 4 digits were always different. I upgraded HiYa (unpaid) and installed the Verizon app too. They still ring though but they say “potential spam”. I wonder if that’s the Verizon app doing it, because I thought that when HiYa picked up spam, they didn’t ring. I thought that when HiYa picked up spam, they didn’t ring. 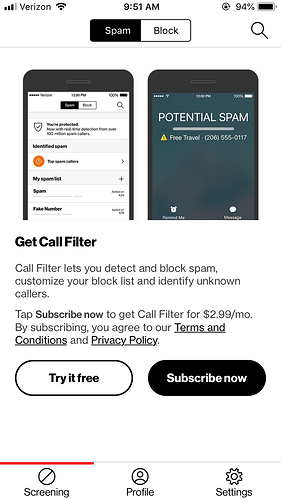 In the HiYa app, tap the Protect icon, is Block Fraud Calls and/or Block Nuisance Calls enabled? I just checked mine and found instead of that a message to change my iPhone blocking settings, I had “HiYa-1” enabled but not “HiYa-2;” my guess is the former only does spam warnings and the latter can do blocking. Yes, when I installed it, it gave instructions on HiYa-2. And I do have the 2 blocks turned on. I wonder if the Verizon app is grabbing the calls before Hiya. OTOH when I look in my missed calls, I see most of the recent ones do say HiYa but there is one from yesterday that simply says “Call Filter” before it. HiYa was not picking stuff up before I updated it the other day. Well darn, I had considered offering Web site instructions but figured the app-based approach would be the most expedient. Lesson learned. Thanks for detailed example; I had a helluva time finding the right pages, Verizon has variations on the “Plans & Services” pages that didn’t lead to the managing apps; but I finally found my way thru the “twisty maze of web pages, all different” to the mother-lode!